2018 is about reimagining what is possible. Transformation can happen on many levels. Where do we begin? Depending on your needs (and your budget) there are many ways to reimagine our spaces to better reflect who we are in the world and how we want to feel. With this latest series, we'll highlight how LOCZIdesign has helped some of our clients transform their spaces to compliment the lives they live. Whether you're looking for quick wins or major overhauls, you're sure to be inspired. Big changes can occur without spending a fortune. It can start with simply decluttering and removing things that have outlived their usefulness, or moving things around to make space more functional. Once you've determined the essential elements don't be afraid to use paint, wallpaper, and tile in interesting ways. With some creativity you can turn any area into a statement of art. 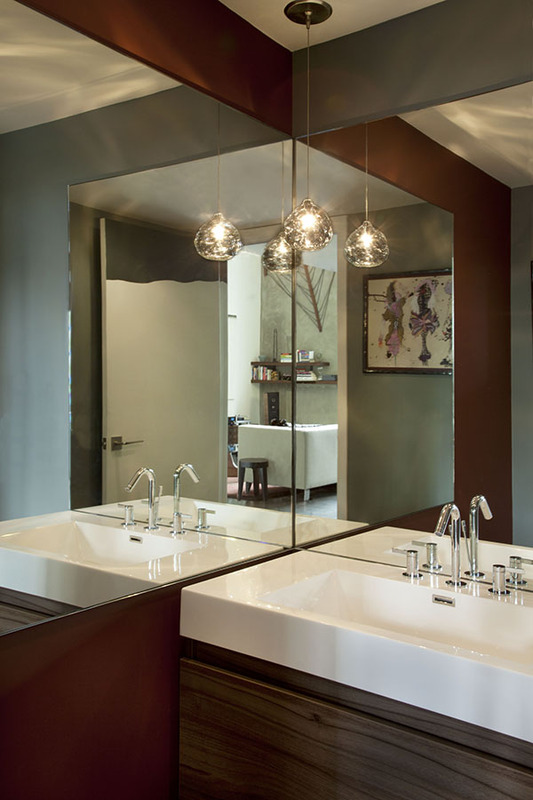 Lighting and accessories can also make a dynamic statement maximizing impact while minimizing expense. Wide shot of the main living area with custom mural painted on back wall using Benjamin Moore paint. 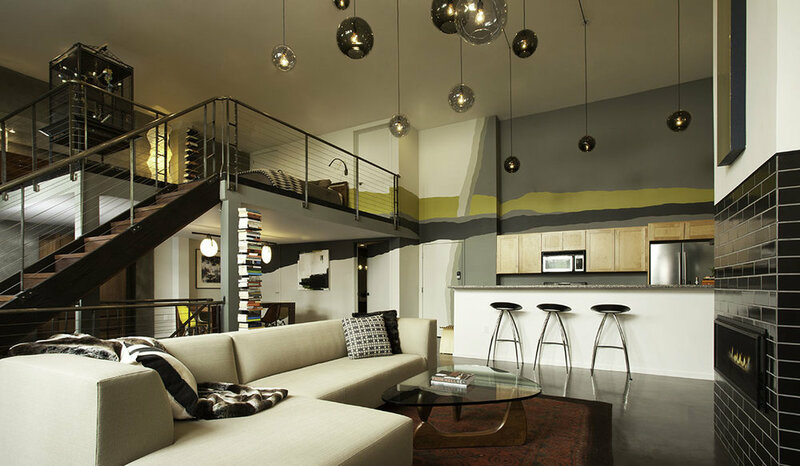 With the help of the LOCZIdesign group, Cynthia and Brian transformed their three-story loft from a cluttered apartment into an artistic and dynamic space that illuminates their midcentury furniture collection. One of 18 units installed in the shell of the Riviera Theatre, this property was built in the 1920s and redesigned by architect George Hauser in 2001. The loft is made up of three floors with a mix of materials including glass, wood, tile and concrete. 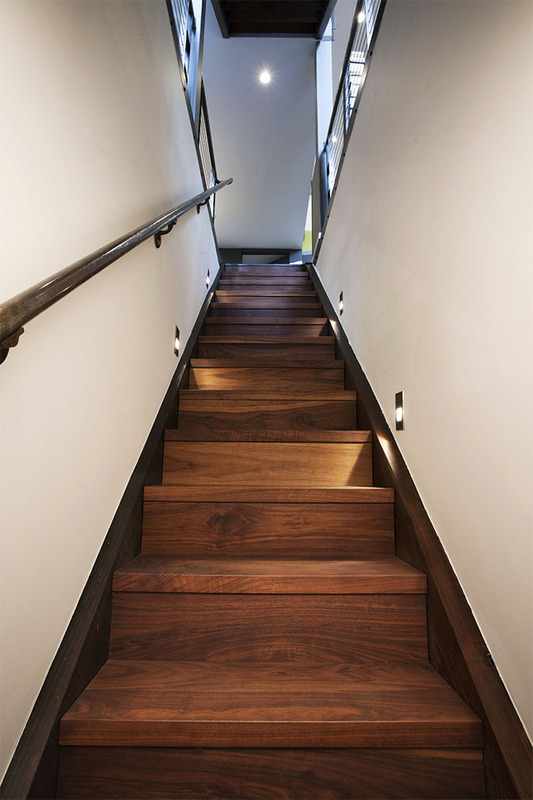 For this extensive project the LOCZIdesign team remodeled two bathrooms and added one, installed concrete floors replacing damaged wood floors, encased the stairwell connecting all three floors, repositioned interior walls, designed custom cabinetry and closets throughout --optimizing space and flow through the home. The team also created custom metalwork and lighting. For Brian and Cynthia positioning the dining room to be under the third level bedroom, tucked beneath the stairwell, made great use of a space previously underutilized while still leaving plenty of room for a large dining table. 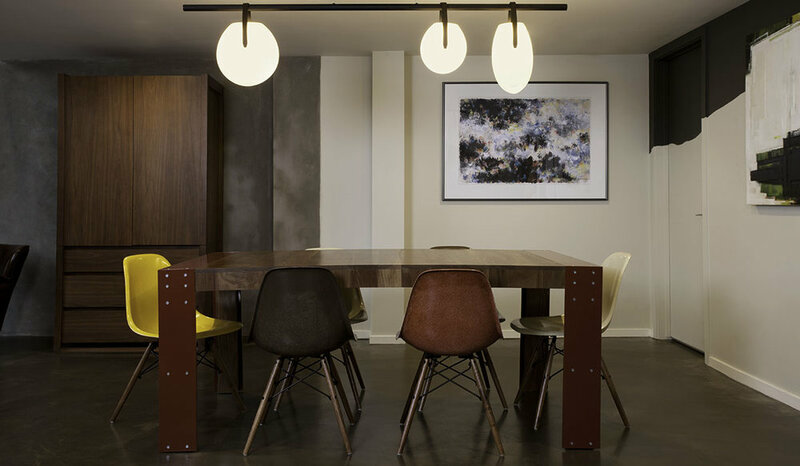 The area is warmed by brown and yellow Eames dining chairs and a Gala chandelier. For the main living space, located on the second level, LOCZIdesign drew attention to the tall ceilings and anchored the area with a dynamic light fixture custom-designed by the team. The design echoes an existing pulley system that was left on the wall and used in the 1920s to operate stage curtains in the theatre. Color-wise, the crew continued warm tones with golds and browns complimented by a black tiled fireplace. Tall ceilings warmed by custom light fixture inspired by remaining curtain pulley system. Tile is another way to make a dynamic statement in a variety of spaces. Check out the transformation for the upstairs bathroom before and after! Waterfall cascade design using Heath Ceramics tiles for the upstairs bathroom. Below, locally sourced black handmade ceramic tiles surround the fireplace and frame the 'side bar' on the second floor as well as the fireplace located in the lower level lounge. 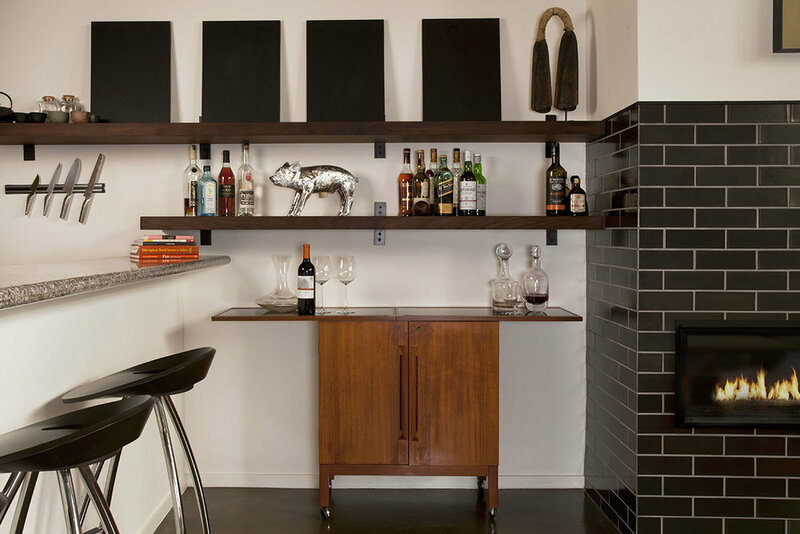 Side bar near dining and living area with fireplace framed by black ceramic tiles from Heath ceramics. Reimagined downstairs lounge including tiled fireplace from Heath ceramic tiles. 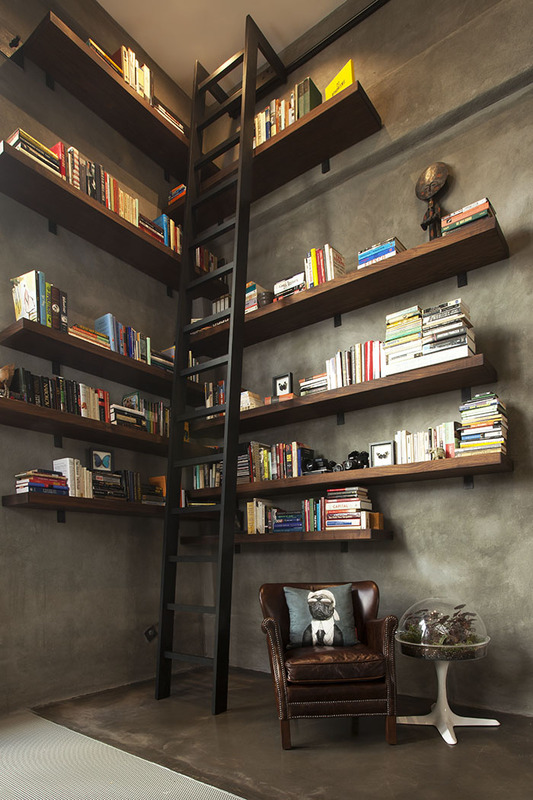 Need a way to showcase your ever-expanding library? LOCZIdesign created this corner nook for Cynthia and Brian. “We needed enough space for our books and room to grow,” Brian says. The interlocking walnut shelving system with 15-foot steel ladder reaches from floor to ceiling. 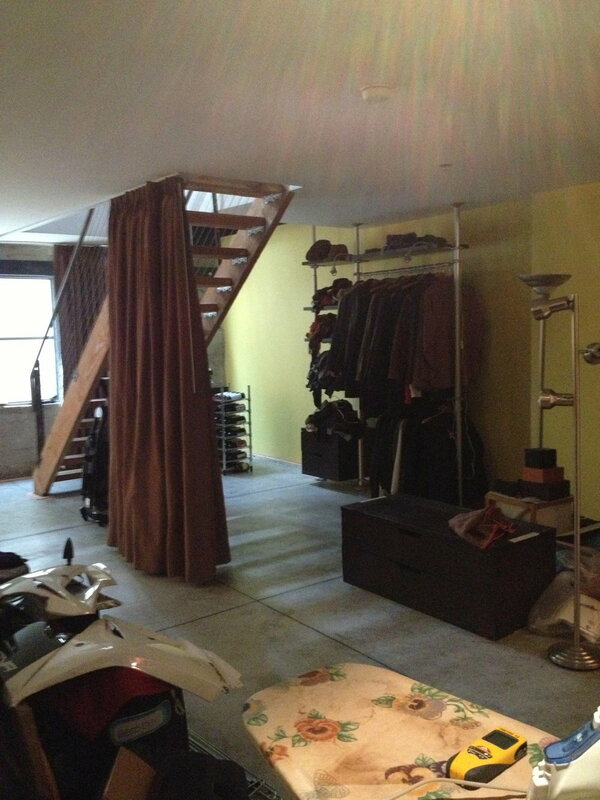 Interlocking walnut shelving system with 15-foot steel ladder. Corner nook created for ever-expanding library. View of bookshelf area before from underneath stairwell. View of stairwell after it was enclosed. Before being transformed into the perfect space to unwind, the downstairs area was once a catch-all. Now it's a gorgeous lounge with a custom workshop at the back dedicated to Brian's hobby making leather goods. While Brian works full time as a professor, he also enjoys making custom leather goods — shoes, belts, wallets and bags — as a hobby. “I took some month-long classes in Europe to learn how to make shoes,” he says. Brian uses the back of the room for his tools and workshop. Downstairs lounge with Brian's leather workshop at the back of the room. One wall downstairs was repositioned to run the length of the room instead of cutting through the middle, opening up the space dramatically. One-third was then used for a built-in closet and a downstairs bathroom was added featuring a gorgeous Victoria + Albert vintage claw foot tub. To house the couple’s custom shoe collection, the designers dug out a space under the stairs and installed custom shelving. 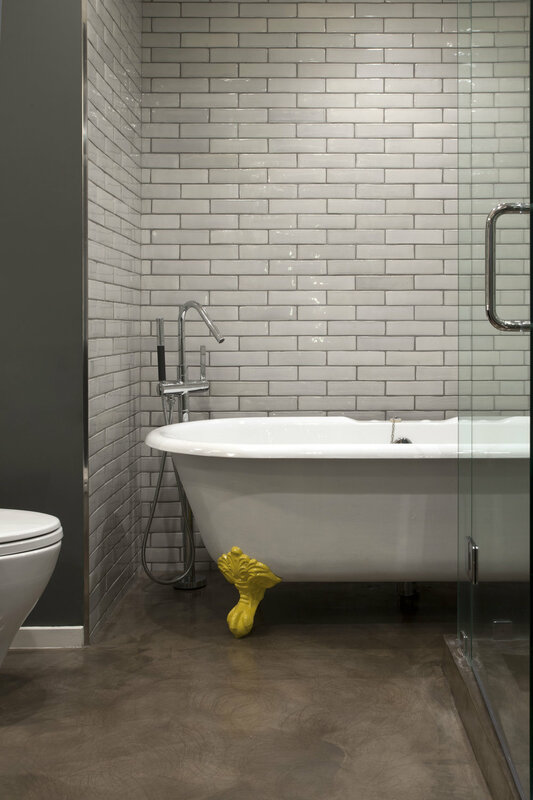 BELOW: Downstairs bathroom featuring Victoria+Albert vintage claw tub. We had fun adding a pop of yellow. Scroll below to see all of the AFTER images. UP NEXT...Ethan and Ashley reinvest in their classic Edwardian.